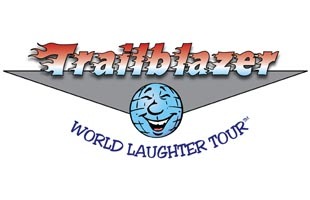 Learn about Membership Benefits - World Laughter Tour, Inc. I read this article and found it very interesting, thought it might be something for you. The article is called Membership Benefits and is located at https://www.worldlaughtertour.com/about/membership-benefits/. Laughter Clubs are a good place to have fun, laugh your stress away, and learn how to prevent hardening of the attitudes. These enjoyable practices help to keep you balanced and healthy in mind, body and spirit. As it relates to the field of integrative medicine, founder Steve Wilson has witnessed phenomenal benefits to participants who were able to make remarkable health and attitude transformations. In the modern era of Gelotology, the science of laughter – and Positive Psychology – World Laughter Tour’s laughter therapy programs represent a unique combination of techniques that are designed to improve physical health and emotional balance, and with a socially-conscious value system. Although research continues, there is evidence that laughter therapy produces quick and lasting results. Changes the way people think about their health. Teaches techniques on how to be less stressed, while enjoying life more. Offers ideas and information for staying happier and healthier. Provides simple strategies that anyone can do to feel good and develop a more positive outlook on life. Helps to develop a sense of humor. Reduces inhibitions to laughter, enabling release of joyful expressions more frequently and easily. Encourages laughter and other positive emotions that can block panic, depression, despair and be used as a therapeutic ally. Fosters better balance between right-brain and left-brain functions. Lifts enthusiasm, morale and motivation. Is consistent with other programs that improve health and well-being. Brings about amazing changes in people’s personal lives. Makes laughter and Good-Hearted Living™ a part of a community’s culture. Is something that can be done by anyone of any physical or mental ability. 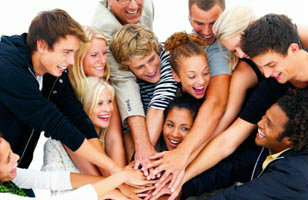 Promotes laughter and Good-Hearted Living™ as a natural way to think and act every day. Leads directly to feelings of well-being and a sense of community. Is a simple program, both in concept and application. Requires little time or resources; is cost-effective. 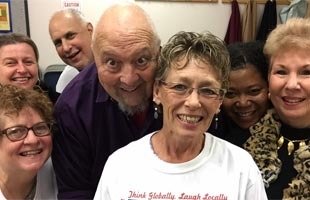 Almost everyone who has been introduced to the Laughter Club experiences life-transforming changes, from mere attitude adjustments to the tremendous health benefits. Because everyone is different, the experiences and transformations may vary. If nothing else, appease your curiosity and come attend!